George Alexander Dobson was born in Llwynypia in 1873. Dobson's family had moved to Wales just before his birth in 1873, his brother Tom Dobson being born two years earlier in Scotland. George followed his brother in joining Cardiff and he played 106 games for the club between 1893/94 and 1900/01, scoring twenty tries. 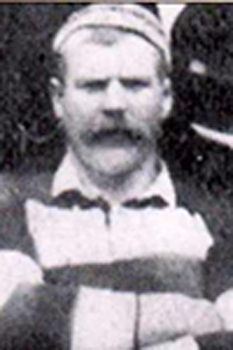 Dobson represented Wales once (ironically against Scotland) as part of the 1900 Wales Home Nations Championship winning season, making Dobson a Triple Crown winning player. Dobson went on to play for Llwynypia (one of the leading sides in Wales at the time) again following his brother. He suffered from long periods of ill-health, dying in his mid 40s, passing away in Cardiff in 1917.